Mobile video sharing startup Klip is adding a new feature that will let its users share their videos with just a select group of friends and family. The app maker has enabled this with the rollout of “Circles,” which is what it calls the private groups that users can set up. 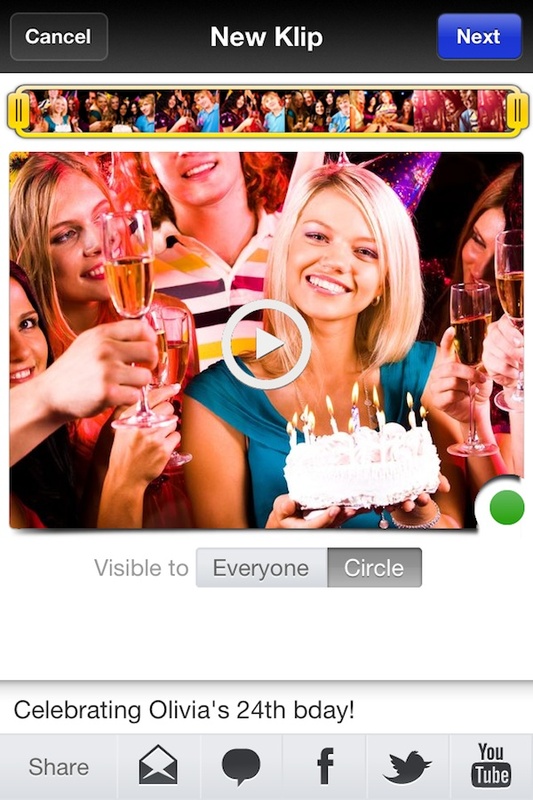 Klip users can decide who is in their circle by selecting other users. When it comes time to shoot or upload a video from their camera roll, they can then choose to share the video publicly to the Klip network or privately, just to members of their Circle. Then, members of the Circle videos can have private conversations without worrying that they’ll be viewed by the general public. Even if a video is originally marked as private on Klip, it can still be shared by the original uploader on social networks like Facebook, Twitter, email and SMS. That said, uploaders can’t switch videos from public to private, or vice versa. They’ll need to re-upload the video if they want to change its status. While social video sharing apps like Klip have grown in popularity, few of them have tackled the privacy issues associated with sharing everything everywhere. Apps like Socialcam and others are great for sharing videos to a wide audience, but not so great at giving users control over exactly who can see them. Klip isn’t alone in trying to solve this problem. Vmix’s Givit, for instance, has also released a website and mobile apps for sharing videos privately among friends. The latest version of Klip — version 2.2 — just became available on the iTunes (s AAPL) App Store and can be downloaded now. In addition to private video sharing, it’s also added new features, like the ability to browse all the videos you’ve liked, as well as the ability to broadcast your Klip activity to Facebook through the social network’s Open Graph.